The Vegan Lavera Refreshing Cleansing Gel cleans mixed to oily skins ! It removes dirt and make-up, leaving skin beautifully clean and fresh. The organic ingredients of ginkgo biloba and grape help revealing smooth and radiant skin. 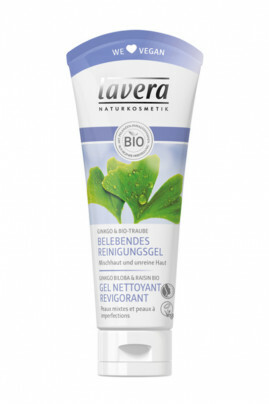 With Lavera Cleansing Gel with Ginkgo Biloba, your skin is purified with a fresh feeling ! Comme toujours avec LAVERA, je suis très satisfaite. Il fait bien son job, sent bon le naturel et ne laisse pas de sensation désagréable sur la peau. Je le recommande ! Remove your makeup with LAVERA Refreshing Cleansing Gel ! Use Lavera Vegan Purifying Cleansing Gel over wet face and lather. Rinse off with tepid water, then with cold water to stimulate the skin. To be used before Lavera Vegan Purifying Lotion.